Found videos full of motivation and reality. Have been going to chiro and physiotherapy for stiff neck and shoulders and sciatic pain and I realise that none of them have tackled my problem as you did. Thanks and I am sure I will find free video very interesting. God Bless the work you do or whoever you believe in. Thanks Susan I appreciate the feedback. 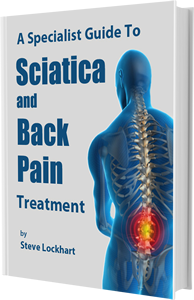 Steve’s technique to relieve Sciatica is fantastic. It gave me instant relief and I would recommend it to anyone. Deep tissue massage should fix this problem but especially to the muscles supporting the spine, in fact full body would be best. You just need to improve the circulation pathways around the whole body and allow to blood to move freely.